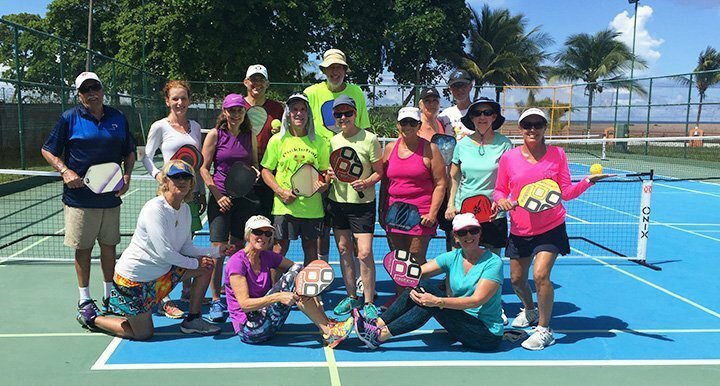 Pickleball is quickly growing around the world including Costa Rica. We just finished a week long pickleball tour in the towns of Jaco and San Ramon, yes pickleball in Costa Rica! I was fortunate to have my dad’s help and expertise for the clinics and to also have my mom and family along for the fun. 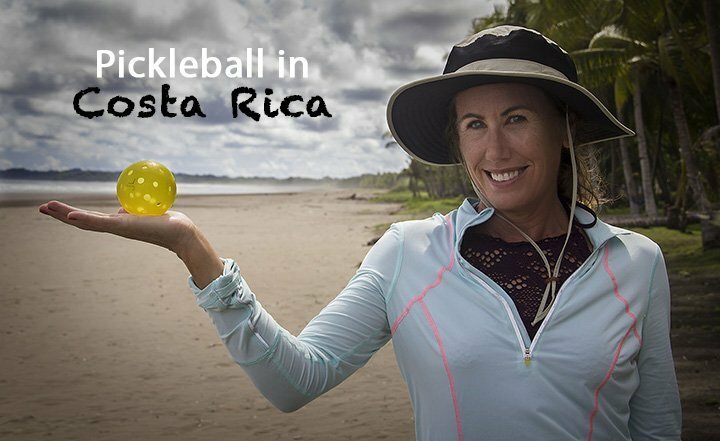 The tour organizers, Tony and Celeste Horpel live in Costa Rica and organize tours for the passionate pickleball player. Our tour included the “real” Costa Rica meaning we experienced a variety of things locals enjoy off the tourist “path”: we interacted with monkeys, iguanas and saw crocodiles, jungle cats, coatis, numerous tropical birds including toucans, macaws and parrots; hammocked on a desolate beach; and played pickleball in San Ramon’s salon communidad with tour goers and locals alike. We began the tour in Playa Jaco where we roamed Jaco beach in front of our resort hotel between pickleball instruction and free-play. The outside pickleball courts happened to be on the edge of the beach and right next to the pool and bar – so convenient! Upon arrival, Tony and Celeste treated us to a little known spot (actually a creek that runs right through town) that had too many iguanas to count. Even though we had an idea of what was to come, we couldn’t spot the iguanas until the mangos and bananas came out. Then, it was like the trees came alive. Iguanas were stepping over each other coming out of the trees—practically to our feet—for dinner. On another side-trip we we visited the beautiful Alma Del Pacifico hotel and restaurant with its palm-lined, secluded beach for a wonderful lunch on the verandah. Following lunch, we lounged (and napped in hammocks) to the sounds, sights and smell of the ocean just feet way. While shell collecting, the 80+ degree water provided a refreshing relief t the hot sun. 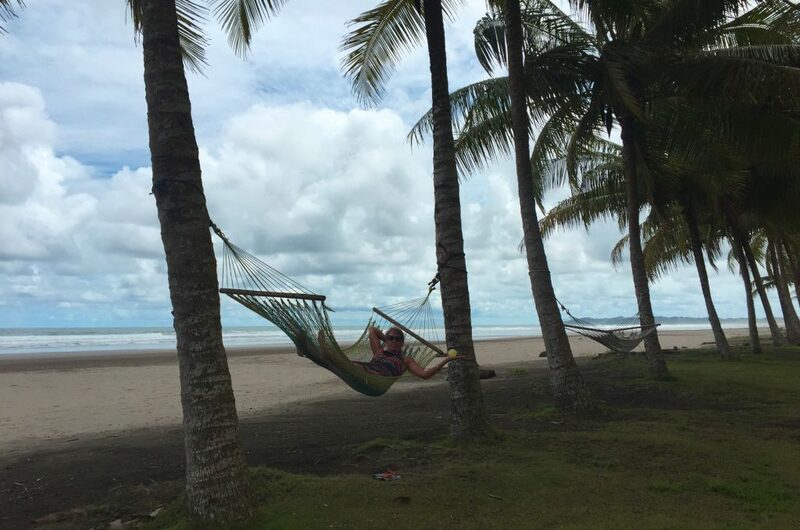 Back in Jaco (and probably across all regions) many of us experienced zip-lining, ATV rides to jungle, waterfalls and pickleball….of course! On the bus ride to San Ramon we stopped at another private beach cove where one can picnic under the trees with monkeys and iguanas freely about. I did my best to lather a pickleball with banana in hopes that a monkey would want the pickleball, but after several attempts to hand feed it was only interested in the banana. Many were hand fed and one even had the nerved to scurry up to our table and take a banana out of a bag. Ha! In San Ramon, we shopped a local farmers market and lunched at a bed and breakfast retreat high upon the majestic mountains where we witnessed the clouds and fog roll in followed by a driving rain–something that happens daily this time of the year. Another day, we toured a small family butterfly farm where we learned the four-part birth and life of a butterfly. On yet another day, we visited an animal rescue zoo that allowed up close and personal views of numerous tropical birds, monkeys and many other jungle dwellers. Both were very unique and interesting experiences. One of highlights for me was a tour of an organic compesino coffee farm (on Facebook check out: Finca Edgar Fernandez). A small family run farm that is big on self-sustaining and low impact eco-creative ingenuity. The coffee process was demonstrated and of course we sipped coffee deep in an unreal jungle setting – PRICELESS. We walked the green sloped terrain filled with coffee plants and a variety of other edible vegetation that outlined the area. All the vegetation had a purpose; if not for the family then for the wildlife creating an ecological corridor. Pickleball in San Ramon was played on Tony and Celeste’s “home” courts. This is a cool community center with a covered roof, concrete floors with permanent lines and temporary nets. It was a pleasure teaching the many locals that came out and joined us. Some of the guys have only been playing less then a year and are good! For a couple of our dinners we were treated to dine at Hacienda Vivace, the beautiful home of fellow pickleball players Andy and Nancy. Andy happens to be a gourmet chef – more yummy food! Oh yeah, and not to be outdone a couple volcanoes Poas and Turrialba decided to spew some ash for our departure trip! 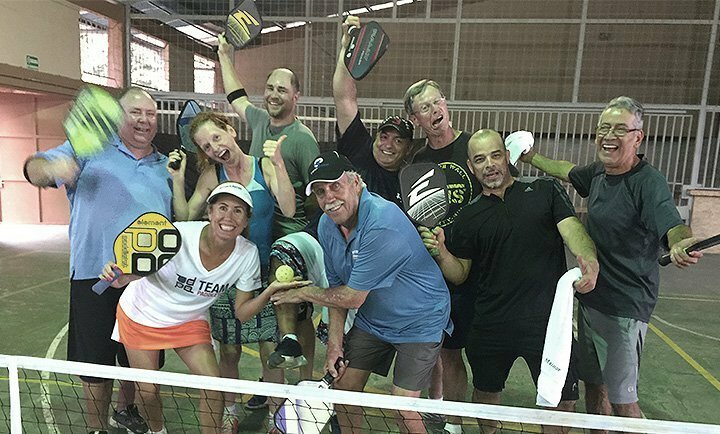 Pickleball in Costa Rica – Pura Vida! Tony with an iguana, coffee farm and garden, and Dad and me posing with the pickleball. We enjoyed your pictures and your comments of your trip. Wish we could have gone too! What an enjoyable trip. Pickleball is branching out to so many countries and it’s so good to see you n your dad and friends all sharing the experience. What a combo- great country and great sport. Sounds like a really nice trip, will have to add it to my bucket list! Was so great being with you on the 1st pickleball tour in Barcelona Spain and now in the 1st pickleball tour in Costa Rica. Your parents were great and so much fun and your daughters are beautiful and of course your handsome hubby. 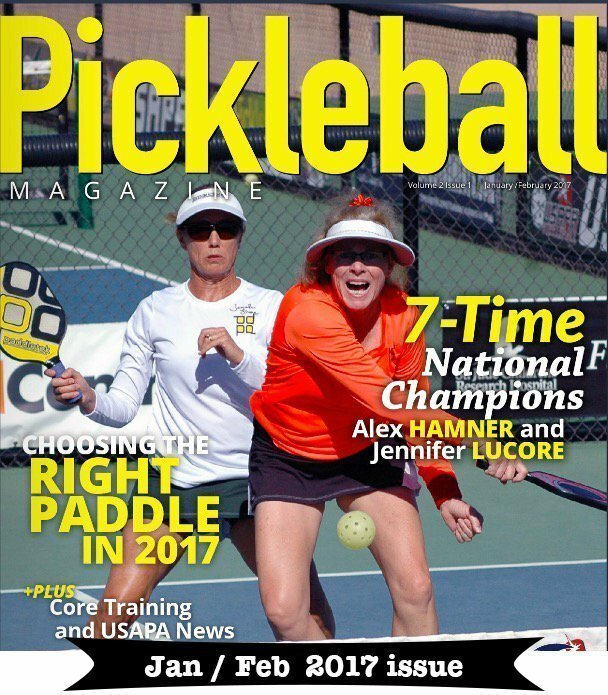 After reading this article on your blog, I’m hoping others will be enticed into going on one of your pickleball tours. Just count on Jacque and I being there. I’m sure you couldn’t get along without us. Great job on the article. Hi Jennifer, remember us from Borrego Springs? I’m the hawk nut. We have been following you since you shared your expertise on our courts. Loved your info on Costa Rica. I used to take college students to the island to study biology. Hi there. My husband and I are travelling to jaco CR in February of 2018. We are staying in a condo on north jaco beach. How far away would the closest pickleball courts be from where we are staying? My husband and I are looking to spend two months in Acosta rica in 2019. Jan and Feb are the dates we are looking at at the moment. We are beginner pickle ball players and are looking for a condo. Community of ex pats where we are near water and can play pickle ball etc. Can you recommend a place where that would be an achievable goal? Look forward to hearing from you. 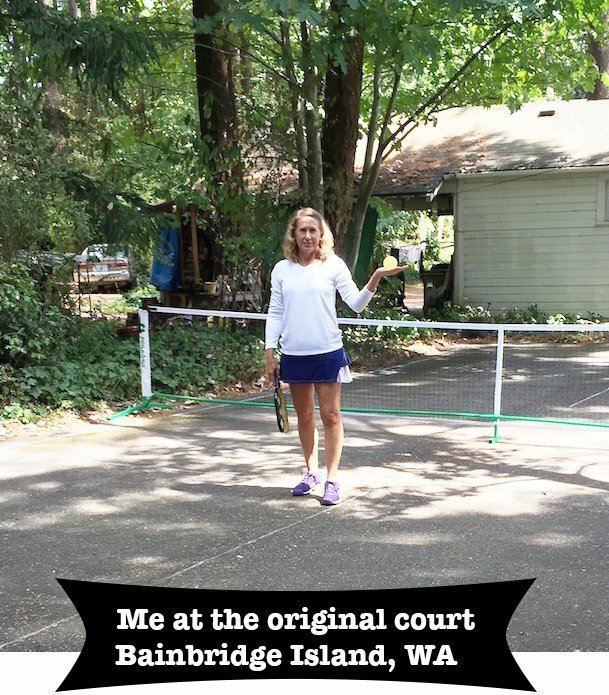 Hello Bev, see my below info for contacting Tony Horpel – the local pickleball Ambassador. Have fun! Traveling to Samara beach in July. With 20 year old daughter, who is attending Spanish immersion. I was turned on to PICKLBALL over 30 years ago in marina del Rey, Los Angeles. The men who introduced predicted its popularity. Shall I bring my portable picklball gear, with me. ? I am hoping to use an already established TENNIS court that can be transformed into a PICKLEBALL COURT.